Recanati Winery’s new Upper Galilee Series presents classic varieties from select vineyards and growing areas. This series is varietal, and each wine perfectly expresses the variety’s particular traits: its distinct aromas, the depth and range of flavors, its usage and the ageing period in French Oak. 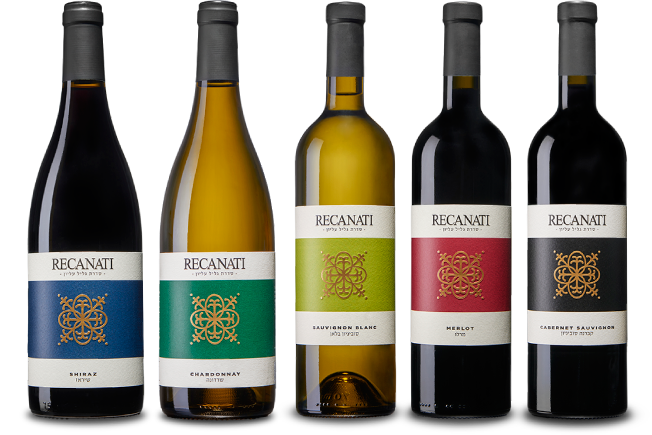 Over the years, Recanati Winery has identified the finest growing plots in the Upper Galilee –destined to grow quality varieties – and the new Upper Galilee Series concentrates on this wonderful terroir, leveraging it to extract the characteristic complexity and refinement of each individual variety. Winemaking Notes: The grapes arrive at the winery in the early hours of the morning. We immediately separate the grapes from the stem without crushing them in order to enable the fermentation of some of the grapes while whole. Fermentation is relatively short (an average of 7-10 days.) This process greatly contributes to the wine’s fruity character, it refreshing flavor and to the softness of the tannins, which bestow a velvety feeling upon the wine. Tasting Notes: The wine has the typical Merlot aroma of cherry, plum and Mediterranean spices accompanied by a gentle oak aroma. This is a bright red, medium-full bodied wine with a fresh berry aroma. Together, this produces a balanced wine perfectly integrated with the warm climate in the region. Winemaking Notes: The grapes arrive at the winery in the early hours of the morning. We immediately separate the grape from the stem without “mashing” or crushing in order to enable the fermentation of some of the grapes while whole. Fermentation is relatively short (an average of 7-10 days.) This process greatly contributes to the wine’s fruity character, its refreshing flavor and to the softness of the tannins, which bestow a velvety feeling upon the wine. Tasting Notes: Cabernet Sauvignon is considered the crown prince of grape varieties and this wine is exactly that. It has classic Cabernet Sauvignon aromas, characterized by black plum, cassis and Mediterranean seasoning accompanied by an oak aroma. Winemaking Notes: The grapes arrive at the winery in the early hours of the morning. After pressing and controlled fermenting at low temperatures in stainless steel tanks, about half of the wine is aged (sur lie) for six months in French Oak barrels. The other half is completing fermentation and ageing in the tanks. Tasting Notes: A refreshing and elegant wine harmoniously combining the classic Chardonnay aroma with an oak fragrance and a buttery texture. Full-bodied, with flavors and aromas of tropical fruits and white grapefruit, accompanied by an aroma of oak and spices. Winemaking Notes: The grapes arrive at the winery at night. After pressing, the juice is fermented in stainless steel tanks, under controlled conditions at low temperature, for 12 days. This preserves the fruity aromas characteristic of this variety. The wine is not aged at all in barrels and thus we are able to maintain its freshness and clear color, the flowery, fruity aromas and the richness of its tropical flavors. Sauvignon Blanc from the Upper Galilee Series is an inimitable expression of the finest Galilean soil and its extraordinary cold climate. Tasting Notes: A particularly aromatic and refreshing wine with flavors of citrus fruits, tropical fruits and flowery scents. Tasting Notes: The wine has a typical Shiraz aroma of violets, lavender and black pepper along with a slight oak aroma. It is a full-bodied wine with a strong black-purple hue unique to this variety.